This Wholly Imperfect Life: Let us all pray for peace this Thursday. The whole World! Let us all pray for peace this Thursday. The whole World! Thanksgiving is fast approaching. Only two days left for this beautiful holiday that we reserve to give a special thanks for all of our blessings. This Thanksgiving I find it somewhat bitter-sweet. What with all the things going on in the world; all the violence and terror, I feel this need to pray with a sense of urgency. I feel we are on the brink of something, well something that can either be terrible or miraculously good. I choose the latter! Why not pray for a miracle? Why the heck not? I write this short blog post to urge you to do the same. As Americans we have this beautiful holiday, why not also turn it into a day of prayer and urgent supplication for the world? Whatever way you pray...whatever faith you belong to....no matter how long it's been since your last earnest prayer, PRAY! Let us pray for a miracle, that we may have peace. Let us pray for the conversion of the hearts of all radicals. Seems far fetched huh? Seems too good to even think about? All the more reason why we should do it! I believe in the power of prayer! I believe, particularly in the power of prayer when hundreds, thousands, heck, why not millions, join in! Pray! Pray! We can change the world through prayer. How? Well if we simply look at the fact that everyone is turned towards the same goal and everyone is, at the same time asking for the same thing, than that already is a change in and of itself. It's just the beginning. Only good can come from prayer! So when you gather round the table this Thanksgiving, pray! Pray for world peace! Pray for peace in our own hearts. Pray for peace in our families! Pray for peace in our governments! Pray for peace in the hearts of all the world leaders. And Yes! Pray for peace in the hearts of all those who are steeped in evil and violence. Pray! 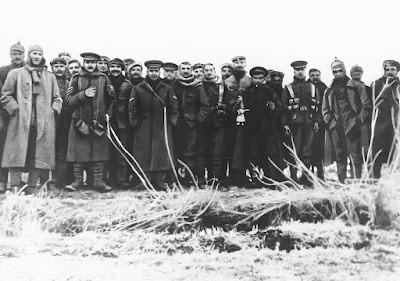 During WWI, there was something known as the Christmas Truce. It "was a series of widespread but unofficial ceasefires along the Western Front around Christmas 1914. In the week leading up to the holiday, German and British soldiers crossed trenches to exchange seasonal greetings and talk." Although we know what followed, more fighting, it goes to show that the true desire of man is peace. If it can happen for a day or two, why not be bold and pray that it lasts, period! And if you are reading this and you do not happen to celebrate Thanksgiving, join us in prayer nonetheless. On Thursday, let us gather together and pray! Pray around the world, for the world! May peace reign in our hearts and in the world!!! May God bless each one of you! Soldiers from both sides taking picture during impromptu truce.